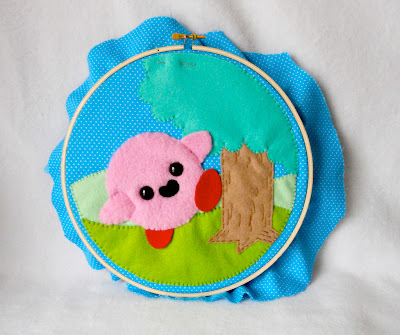 Since I haven't injected this blog with a massive dose of cuteness in a while, I thought I'd do so today by posting the work-in-progress hoop-thing (can you tell I'm an embroidery expert?) below that's being made by fiber artist Michelle Coffee. To see more examples of Coffee's abilities (including the most adorable plushes you're ever likely to lay eyes on), head on over to her Flickr photostream and her etsy shop, Deadly Sweet. That's cute! Did you catch the Rondo of Blood Afghan my wife crocheted? I love it when talented people mix their craft with retro gaming. This is adorable! The finished image is a little bit creepy, though...THOSE TEETH! But what a great series!! I'm working on a felt jigglypuff PS Vita case at the moment, actually... Will post pictures when it's done. But man, I'd kill to have skills like her! It looks like something that would go on top of a jam jar, in a house filled with lovely homemade and antique things. It is a pretty cool piece. I like the teeth. I also like the Doctor Who plushies she's done. She's pretty talented. Love the work she does! As for this piece though, I'm digging her Etsy shop! So, I have to ask you: Do you actually use that Rondo of Blood afghan, or do you just look at it/use it for decoration? I'd probably have a hard time using it myself (for fear of ruining it)! It's mostly just a dark blue case with a small felted/embroidered Jigglypuff in the corner. Working on finishing the Jigglypuff and then will need to make the actual case, which shouldn't take too long. Again, I can't wait to see the final product, Anne. Whether or not you're a good crafter, I'm sure it's going to be adorable. BTW, you should ask Michelle which stitch she used on Kirby. She's on Twitter, I believe. Or you could comment on one of her Flicker photos.